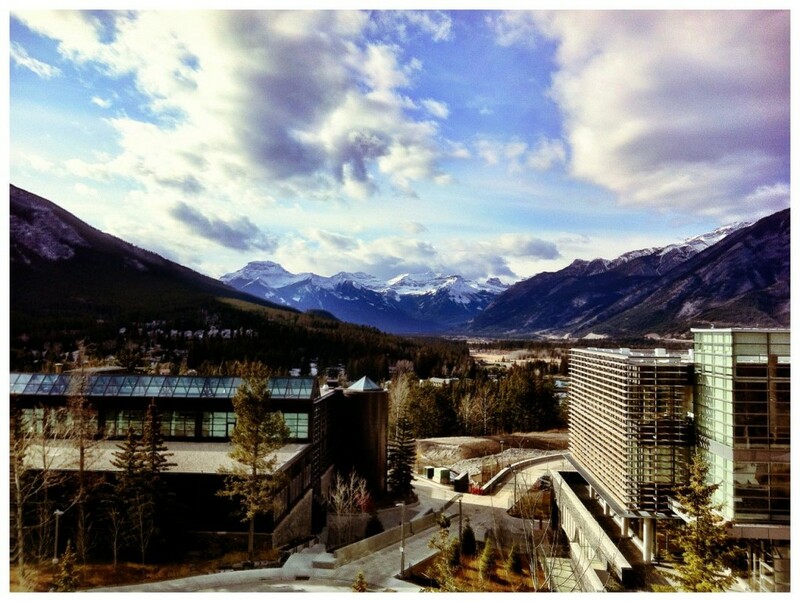 Banff Centre, Alberta, Canada. Photo by Peter Morse. I arrived at the Banff Centre for the 2011 Adventure Fimmakers’ Workshop a couple of nights ago – after a very long flight from Hobart, Tasmania. As I was travelling with Qantas, I guess I was pretty lucky to get away just before the entire airline closed down – but that still didn’t stop my very first flight being about 40 minutes late. This of course cascaded through my schedule, so, along with some administrative stuff-ups with my boarding pass – when I arrived in Sydney to catch my flight with United Airlines to Los Angeles – I ended up sprinting to catch my plane. Not much fun after not much sleep and carrying some heavy camera gear – jostling through endless queues and solemn customs officials. Nevertheless, I made it and had a surprisingly uninterrupted sleep onboard for some of the 13hr flight. Then a few hours in Los Angeles airport before the pleasant Air Canada flight to Calgary, an hour there, then 2 hours by van to Banff. All up, door to door, including transit time: ~27hrs. No wonder I was a bit tired. Banff is amazingly beautiful. I’ve been reaching around for comparisons, and the nearest I can come up with is the South Island of New Zealand – minus the water. The photo above reminds me of a scene from a 1960’s science fiction movie, for some reason (probably the wonderful 1964 ‘Crack in the World’ with Dana Andrews) – and the whole place is really quite remarkable. There is nothing remotely like it in Australia – neither environmentally nor as an institution – it’s an inspiration and I feel very privileged to be here. Even more to my amazement, they have generously awarded me a scholarship, which covers much of the costs (there is no way I could afford it otherwise). I’m covering the rest myself – and I am happy to say it is most definitely money well spent – even before I’ve started the workshop. What a fabulous opportunity – I’ve wanted to come to Canada for years. Since 2004, really, when I was a kind of Artist-in-Residence at the the Zentrum für Kunst und Medientechnologie (ZKM) in Karlsruhe, Germany for a month. That was a lonely time, I recall – but I read Glyndwr Williams‘ wonderful book ‘Voyages of Delusion: The Quest for the Northwest Passage‘ – and that got me thinking about Canada seriously, as a sociocultural historical entity, an environment, as a type of mythos – all colliding in the mad quest for a trading route that didn’t exist then, but which does now, thanks to global warming. It’s a story far too complex to gloss here, but is well worth reading – and in my mind, also forms a part of the imagination that informed my fascination with Antarctica – in some ways it’s part of the same story. Adding to this, I’ve always been fascinated by Glenn Gould‘s ‘The Idea of North‘ – ‘his musique concrète radio documentaries about life in the Canadian wilderness.’ It’s all about the wilderness. So, despite battling through the fug of jet-lag (which is always peculiarly disorientating from Australia to North America), on Saturday night I was delighted to attend a lecture at the Banff Mountain and Book Festival by Wade Davis. I’d never heard of him, though he’s probably the sort of person I should know about: a widely published scientist, adventurer, photographer – and a remarkably eloquent speaker, with a fascinating and terrible story to tell about the Sacred Headwaters of the Skeena, Stikine and Nass Rivers in Northern British Columbia. Truly wild rivers in a truly remarkable landscape, now sitting upon the precipice of destruction by mining activity. There was so much that he said that resonated with me – with ideas and feelings I have about Antarctica, about the wilderness in Tasmania (and the historical battle for the Franklin/Gordon rivers), the vast deserts of the mainland – and the depredations of humanity. So – a whole catalogue of books for me to read – and a strong motivation to return here, as my minds-eye is filled with fulldome images of the Northern wildness. These are nascent thoughts, as I have only just arrived, yet there seems such a confluence that it feels absolutely right to be here: right time, right place. Extraordinary. And needless to say – Canadians are charming and extremely friendly. I knew this already – nice to have it confirmed. Tomorrow the fun begins. During this particular adventure I’ve decided to keep some sort of blog. I’ll only post this first post to the front page as a semi-permanent item, the following posts can be read under the ‘blog‘ menu.